I had wanted to raise mine a few inches- and looked into options- like the Chinese stuff on ebay that claims to raise it 1". Looking at the OEM clip ons, I didn't think that would really make any difference at all. Luckily too, the Gods say that my bike handles better with the rear up a bit more- and shims are used on the rear shock mount to achieve this. I already had my forks pushed up 6mm- as suggested, now they are more like 14mm pushed thru the upper triple. I did have to loosen and rotate the upper banjo for clearance over the upper triple tree. 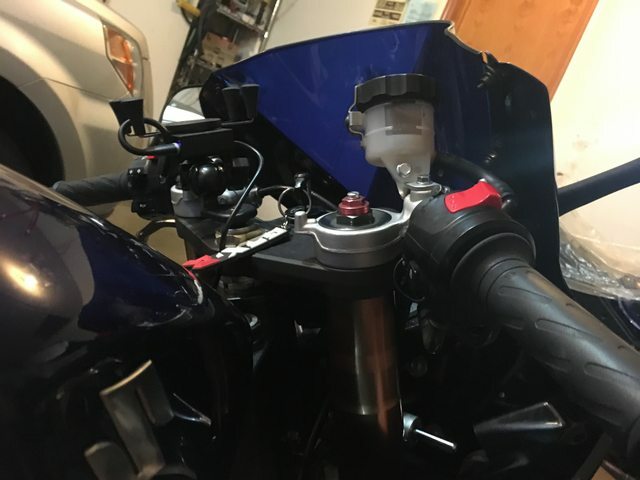 I also had a slightly modified Reservoir mount From bike #1.0- it came with Renthal handlebars) that I used to give it a little more clearance on the fairing. I also rotated my brake lever a few degrees down- where I wanted/needed it anyway. NOw it doesn't touch the fairing at all at full turns on the stops. Rode around my block slowly to test it out- no probs. I think I'm going to like it better on the straights. Actually, the Gods say to raise the entire bike up which means setting the forks at flush (some even use fork extenders). You are raising the rear and dropping the front. Let us know how that works out. tigerblade, Todd_Sails and HydeWhyte like this. The generic suspension tuning threads I've read for this bike, also advise pushing the forks thru the upper triples. I've read anywhere from 4-10mm. I had them about 6mm. This bike has the stock rear dogbone. Bike # 1.0 has a slightly shorter one form the PO, raising it a little. In reality, I dropped the front a little more on this one with this mod, and didn't touch the rear. That relatively raised the rear in relation to lowering the front. With my level of riding, I think it will make cruising straights much more comfortable, and give my neck a little relief too. It actually doubt I'll really notice any major differences in the overall handling. If it's adverse, switches back EZ enough too. I think the recommendations are #1 rear shimmed to alter the swingarm angle to provide a little more anti squat. This prevents the bike running wide too much on power. #2 raise the front to compensate for the loss of trail from #1. Dropping the front would further decrease trail and make a potentially twitchy feeling on brakes entering turns. If you don't feel this twitchiness, I guess your mods are perfectly fine for you. Blkoutbusa, Tinsnips, tigerblade and 2 others like this. Yesterday I rode out to the twisties, about 100miles. MUCH more comfortable on my cervical spine- by raising them ~2"
Didn't really notice any difference in the handling. For now- it's staying this way for me. Hey was your break line long enough for this??? Actually was here tonight, reading some posts and about to post some too. My BRAKE line was long enough, yes. IIRC, I rotated the upper fitting at the MC a bit so it had clearance too. Okay cool I may try that tomorrow and see if that work I have an k1 and being 49 year old my neck isn’t happy after an hour of riding lol and if this free mod don’t work I’ll order some riser and hack my fairing if I have too.. I got nearly 10 yrs on ya! You might have to also pull the brake line out of the wire loop holder to give it some more slack as well. I'm looking into replacing & raising my clip-ons 2"-3" too. Haven't decided on brand but leaning toward the Helibars at this point, although that could change with the other options I'm seeing. Most likely will do it while switching to SS brake lines, with a little extra length to give plenty of slack. Getting a set (of clip-ons) that don't require any cutting of plastics is a must for me. 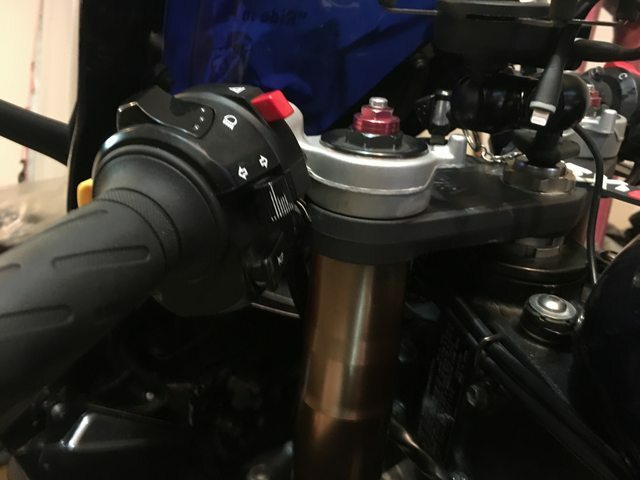 Also want a shorty clutch-lever so I can keep better grip on the bar while letting out the clutch.